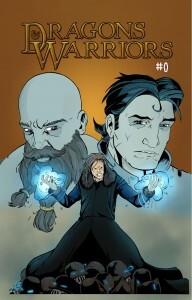 For the past few months whenever I would call up my buddy Tim Morse to talk about my latest comic find or purchase the conversation would turn to his pet project, Dragons & Warriors. Tim has been a writer on this site going on 4 years this July. Needless to say, he has a major passion for comics, even terrible ones (I’m looking at you Uncanny X-Men Annual #11). He also has a ton of love for cards and card games like Magic. Tim is the only person I know that truly appreciates a chase card from a 90’s pack of comic cards. I’ve seen his collection, it’s real. So when he told me that his idea was to create a collectible card game (CCG) and blend that into a comic series, I thought it was pretty ambitious. But, after reading the preview issue, I can say that his dream is becoming a reality. Dragons & Warriors opens with a man named Artifactus promising to bring his fury to bear against his two brothers Relic and Tamerus. We learn more about the three brothers and their father who created all they know and decreed that they would not “create that which he created.” But, Artifactus began to build his own children, that which he called Armor Clad. And using his army he declared war upon the rest of the world. After the outcome of the war, Artifactus is imprisoned, but his influence is still able to bleed out into the world. The races that inhabit the planet are detailed and the story ends with Artifactus pondering whether or not he can get any of them to fight for him. The story from Tim Morse gets you hooked into the world of D&W pretty quickly. For being only 8 pages there is enough exposition about each of the three brothers and the races so that you know their motivations and where they stand. The dialogue also fits perfectly with a fantasy themed comic. I think the writing also does a good job fleshing out why Artifactus is who he is and why he has intentions for destruction. And I could see him becoming a character that the audience can empathize with down the line. The art by Eric Weathers is pretty dang good. The colors are bright and vibrant and really meshes with the world around them. The character designs are well done also. There are a few original races that look pretty menacing and the design and look of Artifactus’ Armor Clad is neat, like spirits inhabiting suits of armor. Even the look of races we have seen before, such as elves and orcs, feel fresh. There is a splash page that you just have to see, it blew me away when I first saw the pencils and looks even better colored. Overall, I’m excited about seeing where my friend is going to take this story. He’s given me some future story points, but being able to read them fleshed out paired with dialogue and panels is going to be fun.The dialogue and the art pair nicely in this preview issue. Not only with the world it inhabits but with each other. The “words” and “pictures”, as the intro puts it, connect to the fantasy genre very well. Parental concern: None at all. Wholesome fantasy story.